Welcome to the Kansas District Court Records Search application where you can find information regarding Kansas District Court Records cases. The cost is $1.50 per search and $1.50 per case retrieved for view. Your search may result in no cases being available. You will still be charged the $1.50 for the search. By proceeding with the search you are agreeing to these terms. As you conduct each search or case retrieval the system will prompt you for your payment method thereby notifying you that you will be charged $1.50 for that search or case retrieval. If you are a Kansas.gov subscriber, you will not be prompted for payment; searches and case retrievals will be billed to your account as usual. 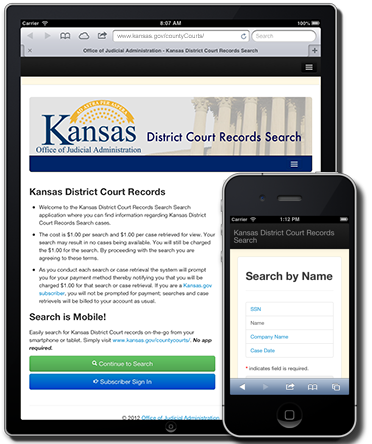 Easily search for Kansas District Court records on-the-go from your smartphone or tablet. Simply visit https://www.kansas.gov/countyCourts/. No app required. Notice: The result of this search contains only case information. It will not be a full record of the filing. If you have questions on how to obtain more information on a case, please contact the County Clerk where the case is filed.